I’m back from Intervention! I had a really good time and met a lot of really cool people. I’m hoping to go back next year, hopefully to be on even more panels, the ones I did were a lot of fun, even the one nobody came to. Damn it, who turned booze gravity back on? I like how Rei is able to get all these pirate like clothes and such, yet he still goes barefoot. i'm guessing that's how they dress down there, floofy dresses and pirate coats. i'm sure they have some hippy reasoning for going barefoot too, but i'm assuming it's because it's hard to get leather for the soles. "we should get out of here, last time i spilled a bunch of booze in the park some crazy ranger guys thought i was a homeless vagrant." 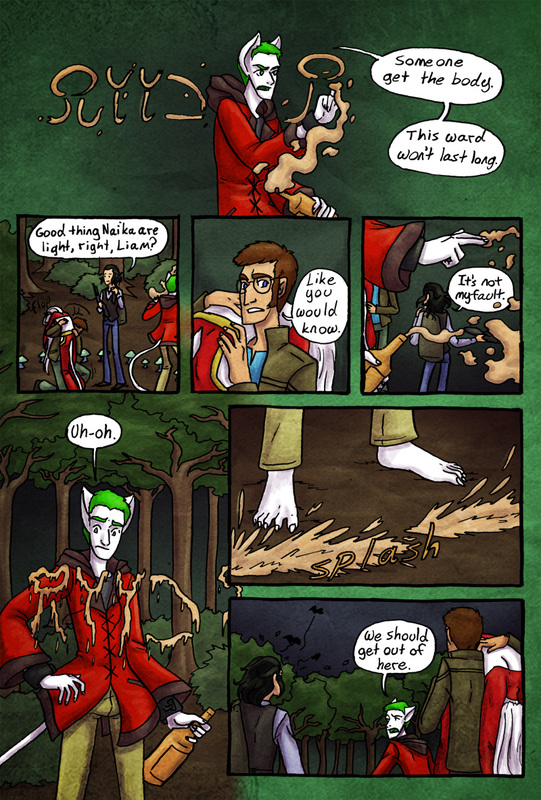 Those aren't bats coming out of the trees in the last panel, right? no, they're totally some guys practicing hang gliders in the middle of the night to win the college championships. totally. you can trust me.